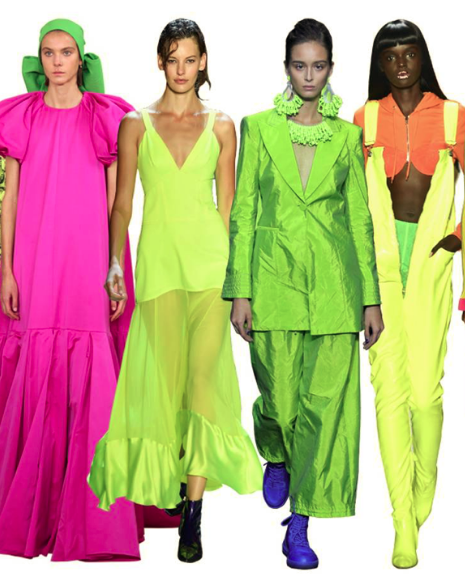 The Spring Summer ’19 runways of New York, London and Paris were ablaze in lime, blinding yellow, extra hot pink and fire orange. Below are our picks to megawatt your style. Want to dip your toe into the neon trend? Start with streetwear, the casual aesthetic is a perfect place to make a statement. It can be one pop or a head to toe monochromatic statement. Want a perfect mix of street and neon? Go with neon reptile like label Off White sent down the runway. Neon eveningwear? Yes, please! Many of the runways at Gucci and Versace were filled with amazing color guaranteed to get you noticed instead of your boring LBD. And finally the perfect compliment to your summer tan? Nothing says summer like a great tan set off by neon beachwear and accessories. Add a neon yellow sun hat, a hot pink beach bag or mix it all up and pair it with a neon lime bikini. Because neon is here to stay!